National Domestic Violence Hotline advocates are available 24/7 at (800) 799-7233. White nationalist Richard Spencer’s wife, Nina Koupriianova, accused him of physically, emotionally and verbally abusing her over the course of their eight-year marriage, according to documents and exhibits filed in court as part of their divorce proceedings. 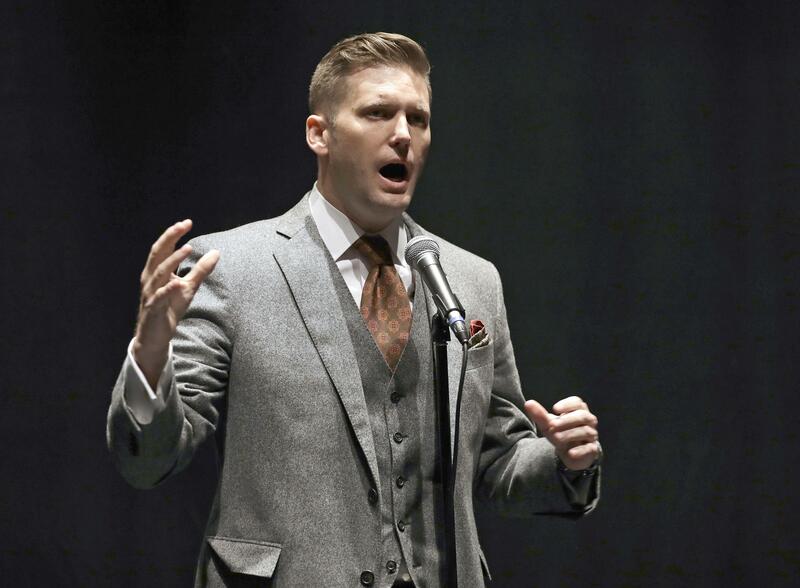 Spencer is perhaps the most prominent white nationalist from the crop of racially motivated extremists who emerged into public view during the 2016 election and events such as the white supremacist rally in Charlottesville, Virginia, in 2017. Often quick to return a reporter’s phone call or email, Spencer has been readily covered by the media as the public face of the loose collection of political ideologies revolving around racism, sexism, anti-semitism, and racial purity that make up the so-called alt-right. Koupriianova’s claims, which were first reported by Buzzfeed, paint a different portrait of Spencer. The couple were married in 2010; the first instance of abuse occurred in 2011 when he “dragged her out of bed by my arms, legs, and hair, dragged me down the stairs, and threw me onto the couch,” resulting in bruising, according to an exhibit listing all the incidents of abuse that she filed with the court. In 2012, he smashed her head into the floor with her down on the ground, she wrote. In 2014, when she was four months pregnant with their first child, he “attacked” her by getting on top of her and holding her neck and jaw, she wrote in the exhibit. “In the next few days, upon arriving to Canada, my mother noticed bruises on my jaw, chest, and leg,” Koupriianova wrote. Photos she said were from the incident are attached in the court filing, though the images as they were distributed to reporters by the court, were of low quality and hard to make out. She also included a July 2014 email exchange with Spencer that she said occurred after the incident. “To be perfectly honest, I am not ready to converse with you after what you’ve done. My jaw is bruised,” she wrote. “He often went into ‘Mr. Hyde,’ mode in the evenings and had issues with handling physical intimacy, including hugs,” Koupriianova wrote of Spencer. Eric Mills and Trevor Carlson, who are listed in recent court filings as Spencer’s lawyers in the martial dispute, did not respond to a request for comment. Spencer did not answer emails sent to him. In 2017, with Koupriianova nine months pregnant with their second child, Spencer flew to visit “without prior warning,” entering her residence and attempting to punch her in the face, according to the court exhibit. She was scheduled for a C-section two days later. In February of this year, Spencer grabbed, pulled and held her by the hair in a parking lot then attempted to attack her before he “shoved his mother into the wall as she attempted to prevent him from attacking me further,” according to Koupriianova. Their 3-year-old daughter was watching in the doorway, Koupriianova said. She also wrote of longstanding attempts to bully, insult and demean her – “from adult temper tantrums to get his own way to violent rages.” She included numerous transcripts of smartphone recordings to bolster these claims. “You always talk about, ‘I want to jump off the bridge.’ What are you waiting for?” he asks. In addition to the chat with the National Domestic Abuse Hotline, the exhibits Koupriianova submitted included a doctor’s letter from a women’s health clinic in Whitefish, Montana, that noted that Koupriianova “expressed concern for her safety and wellbeing,” on several occasions. One of Spencer’s favorite statements was “The only language women understand is violence,” Koupriianova wrote. Published: Oct. 24, 2018, 9:14 p.m. Updated: Oct. 24, 2018, 9:27 p.m.